The focus of this malt profile post is on Chocolate malt. This dark malt variety is named more for its chocolate-like color than a chocolate taste. Chocolate malt is one of my favorite specialty malts and it is my pleasure to present this post. 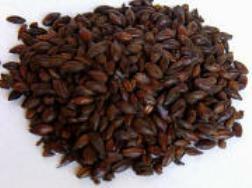 Flavor: Most sources state this malt imparts rich roasted and nutty flavors to a beer. Many said no chocolate flavors are present although one stated that a bitter chocolate flavor could be detected. Color: 300 to 450 SRM. UK versions are darker than US versions. Dark ruby/brown colors are seen in the finished beer. Body: Adds body to beer through the unfermentable sugars present in the malt. Use: This malt is a key to making great porters and stouts. This malt would work in brown ales too. Chocolate malt is not to be confused with chocolate malt milkshakes…although those are good too. Be sure to read all of our malt profiles in the Malt Profile category. Hear, hear. Although pale chocolate malt, at 200-250L and a bit less astringent is seeing more action in our homebrewery these days, the original is still a classic “secret” ingredient in adding color, body, and complexity. Chocolate porter…one of my all time favorites. Is this a good beer to brew for a beginner? Absolutely. I think the second beer I ever brewed was a chocolate porter. Go for it. I think it’s a pretty forgiving style. This malt goes a very long way. I’m really just learning how much of a given malt to use in my mash. I used a .5lb and it is clearly a porter with full choclate and toast flavors dominating the entire beer. Use sparingly or with full knowledge of effect.